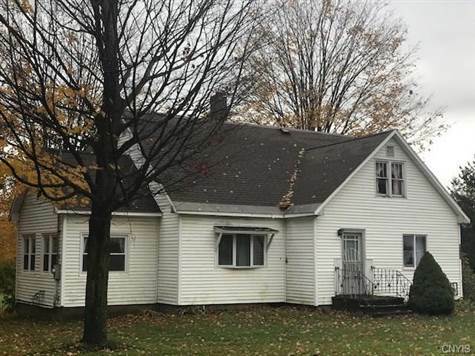 Homes for Sale in Sandy Creek, New York $139,900 1st Carriage House Realty, Inc.
1st Carriage House Realty Inc.
DON'T LOOK FORWARD TO CLEARING THE SNOW FROM YOUR DRIVEWAY? NO NEED TO WORRY HERE, ... SHORT DRIVEWAY AND 7 PLUS ACRES OF PRIVACY IN THE BACK! YES, THAT'S RIGHT, ... OVER 7 ACRES ON A CORNER LOT WITH ACCESS FROM 3 STREETS! THERE IS A HIGH & DRY FIELD BEHIND THE HOUSE, THE BACK CORNER OFFERS SOME WOODS AND A SPRING. LIKE TO TAP YOUR OWN MAPLE TREES? THERE ARE ABOUT 12 MATURE MAPLES IN THE BACKYARD. DON'T JUST DRIVE BY THIS HOME, ... IT'S A MUST SEE, YOU WON'T BELIEVE THE SPACE IT HAS TO OFFER. FORMAL ENTRY WITH COAT CLOSET, LARGE LIVINGROOM OPEN TO SUN ROOM OVERLOOKING THE BACKYARD. FORMAL DININGROOM AND COUNTRY KITCHEN W/ PASS THROUGH. SPACIOUS BEDROOM ON 1ST FLOOR AND GOOD SIZED FULL BATHROOM WAITING FOR YOUR OWN TOUCHES. HARDWOOD FLOORS UNDER CARPETS IN MOST ROOMS. UPSTAIRS OFFERS 3 MORE BEDROOMS AND 1 BONUS ROOM, LOTS OF CLOSETS AND WALK IN ATTIC FOR EASY STORAGE. FULL BASEMENT W/ WORK BENCHES. PUBLIC WATER, NATURAL GAS HEAT, NEW HOT WATER HEATER, ROOF UNDER 10 YEARS!